Keeping in tradition with its elder sibling, Redmi 1S didn’t take more than a few seconds to become unavailable from the market. With registration of around 2,50,000 people for the phone, it was bound to be a quickfire sale. However, the number of phones that were on sale were more than Xiaomi’s Mi3 phones. With 40000 phones available for the first round, the speed at which the phone were taken off the shelf (Flipkart store) shows the trust that Xiaomi has generated in the few months. Mi3 has been loved in general [See our Mi 3 real user review] by the people and this is showing in the adoption of Redmi 1S. According to the company, the first sale lasted only 4.2 seconds. In fact, many of the registered users felt that the phone was out of stock within one second of the sale itself. With a ratio of 1:6, there must be a lot of users who did not get the phone. Redmi 1S offers quad core processor, HD Display and 8 MP camera at a price point of Rs. 6000. The specifications are almost equivalent of a Nexus 4 and this is the primary reason why the phone has everyone drooling over it. Thus, we should expect similar sale patterns for the phone in the near future as well. It doesn’t seem likely that Xiaomi will be able to bring the supply up to speed with the demand. While Mi3 will have competition from Moto G2 that is launching in a few days, Redmi 1S has no competition to care about for some time. Also, the phone is supposed to be launched in other countries as well increasing the demand overall for the phone. The registrations for the next sale have started. 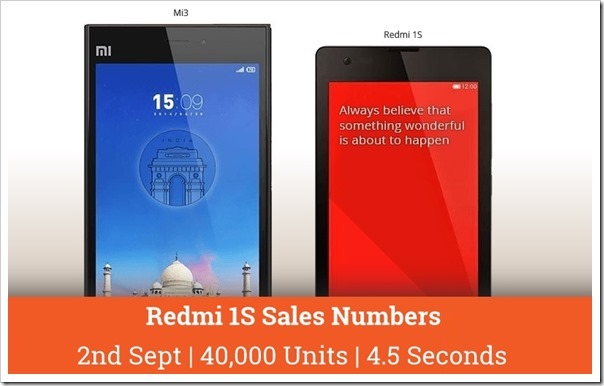 Next sale is going to be on 9th September and if Mi3’s sale was any indication, it would last less than the first sale. I would not expect it to be more than 3 seconds. While we can speculate if the numbers are true or not, the fact is that Xiaomi is generating a lot of thrust in the market and is becoming a serious contender in the lower and medium end. However, Android one is coming from Google and we can expect Motorola to come back with a bang. Two things are clear from here. One is that it is a great time to be a buyer in the mid segment of Android phones. Two is that Samsung’s golden run is all but over in India. All in all Xiaomi is having a purple patch in India right now.